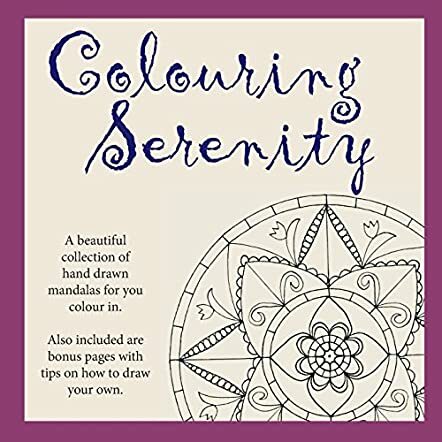 Coloring Serenity by Karen McDermott is a collection of mandalas that can be colored appropriately for one's taste. They generally are of abstract forms, of geometrical shapes and figures, and the full set contains twenty different patterns. These more or less resemble contemporary designs and should be popular, especially for meditation. In addition, the designs are well suited for learning the art of coloring and present a picture appropriate for developing the necessary techniques of concentration. Karen has also provided quite exhaustive guidelines for creating one's own mandalas, and has given blank pages for making those. The significance of a hobby, especially for people with stressful jobs, family responsibilities, and busy schedules can never be overemphasized. We know that those are extremely beneficial in relieving our stress and promoting our health and happiness. And drawing or coloring is a good hobby. Also, the mandala is generally used for meditation to ignite one's thought processes. Pursue it, enjoy it, and soon you'll find yourself developing a greater sense of context for what truly matters in life. This book therefore is doubly helpful; it aids in developing one's potential in fine arts, while providing one with a good object to meditate on. It is also a fact that hobbies matter just as much, if not more, for those persons with less on their plate. That establishes the universal market for such a book as this. This is a well conceived book; the patterns shown are simple enough to color, but complex enough to hold one's attention.